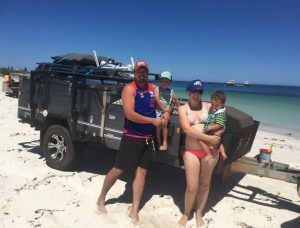 Can A Tent Be Fitted To The Rear Of A 4WD, Truck, Ute Or Sedan ? There are tents designed for crew cab trucks, utes, trailers, pick-up trucks or ‘well backed’ vehicles, SUV’s and tray back vehicles. Basically the tent is located or erected in the rear or ‘well’ of the vehicle. The design provides for the edges of the tent to slide over the vehicle’s side rails to prevent water getting into the bed of the truck. There is also a design of tent for campervans and station wagons and these are sometimes called hatch tents. Basically they are tent-like sleepers that clip over the tailgate or cargo areas of the rear of vehicles like station wagons, 4WD’s, SUV’s and campervans turning it into sleeping quarters. Other designs are made to wrap around the cargo area but allow the tent to remain on site if you want to drive the vehicle away. If you want a tent you can put ‘up in a jiffy’ try Jiffy Outdoors, located at Doncaster East in Victoria, Australia manufacture RVT 4×4 and 4x4L tents made from heavyweight Rip Stop Poly Cotton that attach to the rear of your 4WD. The beauty of this removable Vehicle Sleeve is it gives you access to the back of your 4WD without being exposed to the weather. The Jiffy Outdoors tents have dual entry doors with awnings suitable for left hand or right hand opening doors on the rear of your 4WD. The heavy duty tub floor keeps the water out and the inside of the tent dry. Some manufacturer’s/brand names are Jiffy Outdoors, Cabela, Napier, DAC Inc., Conestoga Truck Tent and Safari Softshell Inc.